Royal Trek in Nepal is one of the finest short village and shrub walk which starts from Bijayapur near Pokhara. The trail follows the foothill of Kalikasthan, Shaklung , Chisopani. 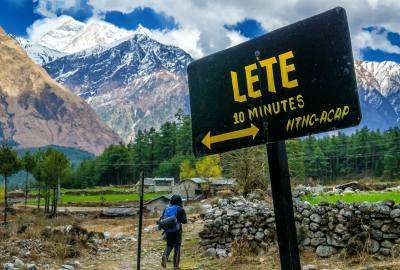 The beautiful trip is labeled ‘Royal Trek’ after Prince Charles from England and his 90 person associates had trekked this small trekking route in the 1980s. Since then it has become popular because of the ease with which it can be completed in three days. However, there is no compromise on views. During the trip, you can enjoy dramatic views of whole Annapurna range, Machhapuchhre, Lamjung Himal and Manaslu Himal which is just breathe taking. And it is a unique experience walking through the cultural Nepal cultural villages, terraced fields and beautiful flora and fauna. Ideal for people on short time visitors, boating Begnas Lake while admiring the mountain panorama, easy walking condition through the foothills. October to May offers beast weather to trek in this area. Day 01: Arrival in Kathmandu, pick from airport and transfer to hotel. Day 02: Fly to Pokhara (823m): Pokhara relax or sightseeing in Pokhara. Day 03: Pokhara to Kalikasthan (1,370m): 1 hour drive, 4-5 hrs trek walk. Day 04: Trek to Syaklung (1,730m) 5,675ft]:5-6 hours walk. Day 05: Trek to Chisapani (1550m): 5-6 hours walk. Day 06: Trek to Begnas Taal and drive to Pokhara. Day 07: Drive from Pokhara to Kathmandu: 6-7 hours drive. Day 08: Sightseeing in Kathmandu. Day 01 :Arrival in Kathmandu, pick from airport and transfer to hotel. Our company representative will greet you at Kathmandu International Airport but make sure about our representative with your "Name Plate" at the arrival gate. You will be then transferred to Hotel. You can either relax in the afternoon or hang around. We have short briefing about your trip. Overnight in Kathmandu. No meals included in this day. Day 02 :Fly to Pokhara (823m): Pokhara relax or sightseeing in Pokhara. After hot breakfast drive to domestic airport and we dake a exciting scenic flight to Pokhara from Kathmandu view of spectacular panoramic view of Ganesh Himal, Manaslu, Lamjung Himal and most of Annapurna Himalayan Range are seen. Upon arrival in Pokhara, we visit Davis fall, Gupteswor cave and Mountain Museum, stroll around lake side. Stay overnight in Hotel Splendid View. Meals Included: Breakfast. Day 03 :Pokhara to Kalikasthan (1,370m): 1 hour drive, 4-5 hrs trek walk. Today, after breakfast we drive to Bijayapur Khola to begin our trek. Initially we start our walk for about an hour through flat paddy fields and cross the river. After crossing the river the trail starts to ascend to Kalikasthan. Lunch will be served midway through the climb. After arriving at Kalikasthan, we rest for some time then explore the surrounding areas. We spend overnight at a local guesthouse. Day 04 :Trek to Syaklung (1,730m) 5,675ft]:5-6 hours walk. After breakfast, we start walking through the villages. We walk along the ridge of the mountain which offers good views of Annapurna and Lamjung Himal. Today, we can explore many villages, its locals and the rhododendron forests. Overnight at Syaklung in local guesthouse. Day 05 :Trek to Chisapani (1550m): 5-6 hours walk. Walking through the Gurung village gives an opportunity to observe the local lifestyle. We move ahead playing a game of hide and seek with the rhododendron and Sal trees. Half way through the walk there is a 400m descent, then a 600m ascent for us to arrive at Chisapani. This is the best view point to see the Himalayan Panorama. You will see Dhaulagiri to the west of Annapurna. Overnight in guesthouse. Day 06 :Trek to Begnas Taal and drive to Pokhara. Today we walk half way down the hill to Rupatal and climb about 200 meters to arrive at Sundare Danda. Walk 15 minutes down to Begnas Tal and enjoy an hour of boating. Transfer to Pokhara, check in at a hotel and take rest or explore the Lake side. Overnight at hotel. Day 07 :Drive from Pokhara to Kathmandu: 6-7 hours drive. Early morning, we take a tourist bus to get back to Kathmandu. Watching scenic countryside en route makes our long bus journey interesting. Upon arrival in Kathmandu, your guide will transfer you to your hotel. Rest of the day can be spent at leisure or perhaps catching up with some last minute shopping or exploring any sights you missed during your first day in Kathmandu. Overnight in Kathmandu. Day 08 :Sightseeing in Kathmandu. Today after breakfast, we start a guided tour to several of the most historical and spiritual attractions in Kathmandu. Some of these landmarks are considered World Heritage Sites including the historic Durbar Square, the sacred Hindu temple of Pashupatinath Temple, the famous 'Monkey Temple' (Swayambhunath) and Buddhists shrine (Buddha Nath) which is one of the largest Stupas in the world. In the afternoon, there will be a pre-trip discussion where we can meet our trek leader and other team members. Himalayan Glacier Trekking briefs us regarding our trek as well as provides us opportunity to ask any questions we may have regarding our upcoming adventure. You might shop around the city if you need any gears for the trek during the evening time. Overnight in Kathmandu. Day 09 :Farewell Friend It is trip conclusion day today! There is nothing to do but trade emails with travel companions and organize the photos. If you have more time you can do some shopping or sightseeing. A representative from Wilderness Excursion will take you to the airport approximately 3 hours before the scheduled flight. On your way home you'll have plenty of time to plan your next adventure in the wonderful country of Nepal. Kathmandu - Pokhara by domestic flight. Pokhara - Kathmandu by toursit coach. Other ground transport to/from trekking starting and ending points. All accommodation and breakfast during the trek on twin/double sharing basis. An experienced local English-speaking trek leader (trekking guide). Assistant trekking guide if the group size above 6 people. Sherpa porters to carry luggage (2 trekkers:1 porter, weight limit 25 kg). Wages, insurance, equipment,accommodation, and food of your guide and porters. All bar bills and beverages such as coke, fanta, sprite etc. Domestic flights (Kathmandu-Pokhara-Kathmandu) if required. Personal expenses such as phone calls, laundry, extra porters. All accommodation in Royal Trek are on twin and double occupancy basis included in the trip price and are chosen based on standard of hygiene, standard of service and food, location, etc. While in the cities (Kathmandu and Pokhara) you will be accommodated in Hotel Samsara Resort in Kathmandu and Hotel Splendid View in Pokhara whereas you will be staying in standard teahouses during trek. The teahouses provide basic facilities including wooden beds, foam mattresses and toilet facilities. If you prefer a single room, you may indicate your preference and get single rooms on request by paying single supplement charge of USD 125. However, you need to understand that in some remote places single rooms might not be sufficient always even by paying single supplement. You will be served breakfast while in Kathmandu, Pokhara and in the trekking. After completion of your trek we will have a farewell dinner consisting of authentic Nepalese cuisine. A Typical Day On The Trail. Soon after first light your Sherpa knocks on your door and offers you a cup of warm tea with a smile. After freshening and finishing up your tea, you pack your bags and assemble in the dining hall for a hearty breakfast before setting off on the day`s trek. After approximately 2-3 hours of trekking you take a break for lunch somewhere in the trail. After a relaxing lunch, you typically spend around 2-3 hours or even more sometimes on the trail before reaching your stopping point. Throughout the day, you will take frequent rest breaks and take time to admire the fascinating mountains views. You take plenty of pictures of yourself with incredibly panoramic mountains, rivers, landscapes, prayer flags, temples, shrines, cairns, monasteries, etc. Once you arrive at your teahouse, you take a brief rest, shower, and have a light snack with tea or coffee. If you are so inclined, you may take a short walk through the village and surrounding neighborhood. After checking into your room you have time to read or chat with fellow trekkers and your Himalayan Glacier crew. Following a warm dinner in a cozy dining hall your trek leader briefs you on the next day`s itinerary. You place your order for breakfast which allows your guide to have everything ready for you for the next morning. Extra time can be spent reading, enjoying some drinks or playing cards. Your Wilderness Excursion support team loves to teach various Nepali card games as well as learning new Western games. Finally, it`s off to bed for a well earned night`s rest before starting all over again the next day.